From the Task List or Gantt Chart, while you are in add or edit mode for a task, you can click the "Advanced Task Settings" icon in the Action Options column (The Action Options column is a default column that displays. If you don't have it, you can turn it on, see Page Display Options for more details). Indicates whether or not the task being entered will be a roll-up task calculation of one or more tasks to be entered, with this task as the Summary Task. Defines a rule that must apply to the task schedule. These are additional rules to predecessor/successor relationships and will override date settings that would otherwise be determined by predecessor/successor relationships. Click drop-down arrow to see a menu of Constraint rules. Further information on constraints is contained in a Constraints. Works in conjunction with Constraint Type. Further information on constraints is contained in a Constraints. Sets the duration value to calculate in full 24 hour calendar days, as opposed to working time within work days. Is used to mark a particular point of measurement of completion in a project. It displays with a special symbol on a Gantt chart to designate a particular date as a milestone. Click to check the box if completion of this task will represent a milestone in the project. Indicates whether or not task owners and resources assigned to the task, as well as project managers on the project, can input time entries and expenses for the task. Click the box to indicate Yes if you intend to track time and expense entries for the task. 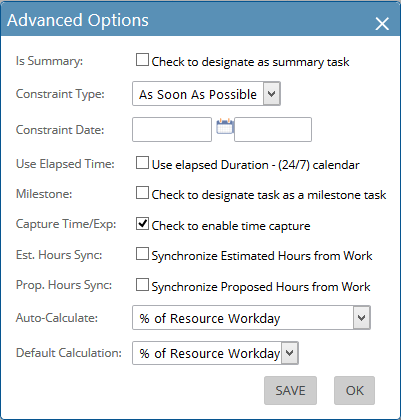 Will automatically set the estimated hours for the task to equal the Work hours. As long as this option is checked, the estimated hours value will change with any change to the Work hours value. This value is often checked when the task is first entered, and unchecked afterward to maintain a set comparison value as changes occur to the Work. Will automatically set the proposed hours for the task to equal the Work hours. As long as this option is checked, the proposed hours value will change with any change to the Work hours value. This value is often checked when the task is first entered, and unchecked afterward to maintain a set comparison value as changes occur to the Work. % of Resource Workday is the default, as it is the most commonly used and the easiest to understand. This calculation allows the project manager to set a schedule based on the duration of the task, while manually entering the total work (hours) to complete the task. The system then automatically calculates the percentage of each of the resource’s workdays that will need to be allocated in order to complete the task. Resource Work allows manual entry of the duration and the % of resource's workday, then uses those values to automatically calculate the total work that will be applied to the task. Has the same working rules as Auto-Calculate. The difference is that Default Calculation changes the default calculation type for every subsequent edit session for this task.